The nervous system is divided into two parts; the central nervous system and the peripheral nervous system. The central nervous system is composed of the brain and the spinal cord. The brain, which has multi-level organized neurons, and connections of indefinite neurons, is divided wholly into grey and white matter. Grey matter, also known as substantia grisea, is the part of the brain that is controlled by the nerve cell bodies and the majority of the true dendrites (numerous, short, branching filaments that carry impulses towards the cell body). The cell body is the area of the neuron that is highlighted by the existence of a nucleus. Grey matter has no myelin blanket. The real processing is concluded in the grey matter. It was given the name gray because of its appearance. It has a grey color because of the grey nuclei that comprises the cells. It fills about 40 percent of the whole brain in humans, and consumes 94 percent of oxygen. The neurons of the grey matter do not have extending axons, or long, thin projections of neurons, that send electrical signals away from the soma (another name for the cell body of neurons). Neurons create networks, in which nerve signals travel. From the dendrites to the end of its axons, the signals reproduce in the neural membrane by way of electrical modes. Neurons do not make body contact with each other when conveying messages. The neurotransmitters serve as the medium to connect one neuron to another neuron. The senses of the body (speech, hearing, feelings, seeing and memory) and control of the muscles, are part of the grey matter’s function. The white matter, also known as substantia alba, is a neuron that is made up of extending, myelinated nerve fibers, or axons. It composes the structures at the center of the brain, like the thalamus and the hypothalamus. It is found between the brainstem and the cerebellum. It is the white matter that allows communication to and from grey matter areas, and between grey matter and the other parts of the body. It functions by transmitting the information from the different parts of the body towards the cerebral cortex. It also controls the functions that the body is unaware of, like temperature, blood pressure and the heart rate. Dispensing of hormones and the control of food, as well as the intake of water and the exposition of emotions, are additional functions of the white matter. Axons are protected by the myelin sheath, which provides insulation from the electrical processes, allowing them to perform nerve signals more quickly. It is also the myelin that is responsible for the white appearance of the white matter. 60 percent of the brain is comprised of white matter. 1. Grey matter is made up of nerve cell bodies, and white matter is made up of fibers. 2. 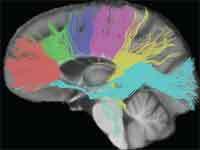 Unlike the white matter, the neurons of grey matter do not have extended axons. 3. Grey matter occupies 40 percent of the brain, while white matter fills 60 percent of the brain. 4. Grey matter has a grey color because of the grey nuclei that comprises the cells. Myelin is responsible for the white appearance of the white matter. 5. Processing is concluded in the grey matter, while white matter allows communication to and from grey matter areas, and between the grey matter and the other parts of the body. 6. Grey matter has no myelin sheath, while white matter is myelinated. Ian F. "Difference Between Grey and White Matter." DifferenceBetween.net. February 26, 2018 < http://www.differencebetween.net/science/health/difference-between-grey-and-white-matter/ >. This information is not correct. Oligodendrocytes myelinate neurons in the Central Nervous System. Schwann cells myelinate neurons in the Peripheral Nervous System. The difference between grey and white matter is caused by the different supportive cells that myelinate the neurons. I have searched all sites but this is the best answer than all . I have a TBI with multiple lobe damage. This helped me understand why I have certain impairments. I thought it was “simple” lobe damage, but it actually has more to do with grey and white matter damage. Great article…. Brought me back to sessions with my amazing diagnostition, Neuropsychiatrist! He sent me for a SPECT Scan that showed exactly where my brain damage (lack of blood flow) is. GREAT GREAT ARTICLE! Are you on a new rx or have you been on one for a long time? It’s called Tantive Kinesis. I had it for a day due to an allergic reaction. It’s awful! That is what was happening to my 10 year old daughter. It ended up her having multiple tia’s and multiple strokes snd 1 major due to moyamoya. Very rare and not all dr.s or hospitals now. If it was caught earlier she would have never gotten the major stroke. She was perfectly health Caucasian girl with no other symptoms . An involuntary movement occurs when you move your body in an uncontrollable and unintended way. These movements can be anything from quick, jerking tics to longer tremors and seizures. You can experience these movements in almost any part of the body, including the neck, face, and limbs.. Does this have anything to do with feeling nauseous all the time, like Really Bad? The info isnt exct correct…the communication function cms in grey matter not in white. !